Right now everyone is all about "Wonder Woman," and with good reason. She's a superpowered super hero with 75 years of history, and her film is a critical and commercial success so far. But she's not the only female hero leading a movie in the summer of 2017. DISCLOSURE: I saw the below featurette at BlogPaws 2017 in Myrtle Beach, SC, which was sponsored by Merrick Pet Care, a proud supporter of "Megan Leavey." Merrick Pet Care is a proud sponsor of BlogPaws. However, I did not receive any payment for this post. 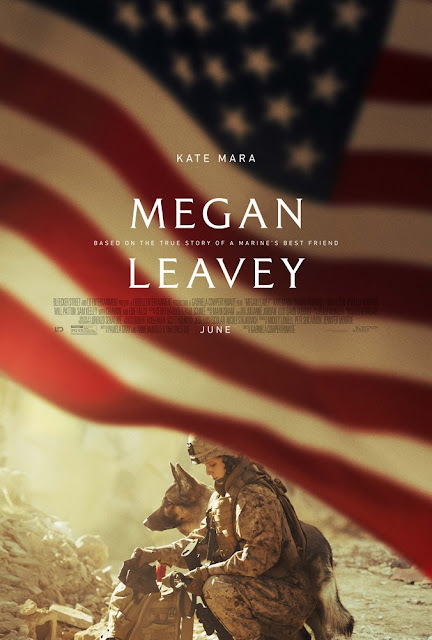 "Megan Leavey" is the true story of Marine Corp. Megan Leavey (Kate Mara) and her military working dog, Rex. Together the pair completed more than 100 bomb sniffing missions in Iraq. But in 2006, the pair were wounded when an IED exploded. She was awarded the Navy and Marine Corps Achievement Medal with a V, which denoted heroism in combat. It began a years-long mission for Leavey to adopt Rex. But "Megan Leavey" is more than just a war movie. It's also about the human-animal bond. There are over 700 dogs serving overseas for the United States military. The Military Working Dog Breeding Program in Texas raises these troops -- "warriors," Common's character Gunny Martin says in "Megan Leavey." But to the handlers who work with these dogs, they're more than warriors. "What's crazy is I knew Rex was a great dog, but once you get thrown into that situation where this is real life, you have to really put all your trust into that dog and be very in tune to each other, and make everyone behind you feel like we're going to be OK," Leavey says in a featurette for the new movie about her life, opening June 9. After the two finished their deployment, Leavey and Rex spent almost a year going through rehabilitation for their injuries together. Leavey said to consider the bond you might have with your pet and multiply it by 100. That's how tight she was with Rex. "Any time I was having a hard time, or was scared or nervous, he was the one constant in my life," Leavey told BlogPaws at the movie's premiere. But when handlers are no longer on active duty, they can't just take their dog home. Rex stayed with the military. While dogs may eventually be adopted, not all of them are. Leavey's fight to keep Rex is one of many cases that eventually led to President Obama signing a law in 2015 that would allow military dogs allowed to retire in the U.S. -- and handlers would get the first chance to adopt their dogs. So consider seeing "Meghan Leavey," in honor of heroes with both two legs and four. Get a free ticket to "Megan Leavey"
And here's a chance to get a free ticket to see the movie! Throughout June and July, if you buy a bag of Merrick Backcountry dog food at Petco, you can submit your receipt online for a free ticket to see the film. More details on the Merrick Facebook page. Lulu sniffs out the Merrick Backcountry Hero's Banquet food at BlogPaws. BONUS: Buy a bag of Merrick Backcountry Hero's Banquet dog food and proceeds go to K9s for Warriors, which provides service dogs for veterans. My dogs passed of old age three years ago, I have now 5 cats at my age adopting more pets means knowing there is someone who will take care of them when I'm gone. In my case there is no one, I pray I out live them. All my pets are on Merrick wet food, It's a good product with lots of moisture that cats need. I buy from Chewy.com because the food is always within date, fresh and shipped quickly. I'm proud that Merrick sponcers this movie, in many countries dogs and cats ore treated cruelly and they need to know a dog is more than a fur bearing meat sack! you know the countries I'm talking about. My cats are smart and like my kids, but I do miss my dogs. Horses and dogs have given their lives for many countries and I think it's time to make laws to stop killing them for meat and hides. Cats don't have the same calling mostly because no one has really stopped to train them for protection, cats do have hero's also. I love all animals but horses and dogs have served in the military since war was a part of life...they deserve better.